New Bolivian President Evo Morales and Venezuelan President Hugo Chavez have confirmed eight agreements to create greater cooperation between the two countries. Chavez said the two governments are united in a “battle against neoliberalism, against capitalism”. The areas that Venezuela and Bolivia have agreed to act on include health and education, as well as energy and agriculture. The agreements were finalised on January 23 2006 in the government palace in La Paz, Bolivia. So they will end up in a battle against reality, wealth, longer lifespans and morality....they deserve all that they have coming to them...but the people who have no power don't, and thats a shame. The problem is that Chavez is making a fortune from oil, so they can subsidise the waste by funding the poor who support them. 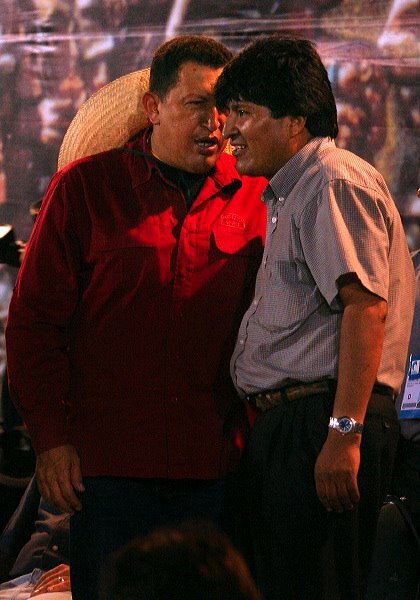 What's Chavez doing talking to that guy from CHiPs?